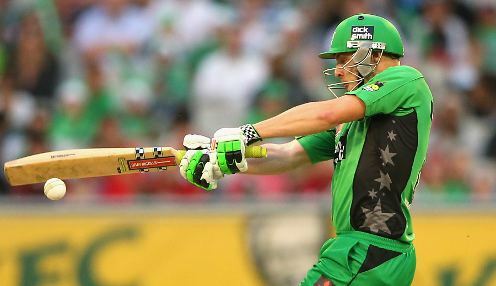 Melbourne Stars will have the chance to go from last to first in the Big Bash League, after reaching the final by beating Hobart Hurricanes. The Stars, who only won two games last season and finished with the wooden spoon, won by six wickets at Blundstone Arena. Daniel Worrall proved to be their unlikely hero against the team who had topped the table at the end of the regular season. Worrall, who only came into the team late in the season, was playing just his 17th game despite having been with the Stars for six seasons. He took 4-23 to win the player of the match award, having claimed his first two wickets in his opening over. He had Matthew Wade caught behind off his first ball of the semi-final, to break up an in-form opening partnership. Wade and D'Arcy Short had piled on 810 runs together in 14 innings during the regular series, and had finished first and second on the run-scorer ladder. Having removed the wicketkeeper, he bowled Caleb Jewell with the final ball of his first over to leave the home side 5-2. Short made 35 from 21 balls before being caught at mid-on off the bowling of Adam Zampa, but George Bailey (37 from 32) and Ben McDermott (53 from 42) were able to steady the ship. Worrall, though, returned late to dismiss Bailey and Simon Milenko as the Hurricanes battled their way to 153-7. The Stars lost opener Ben Dunk just seven balls into their reply, but they were able to stay ahead of the required rate. Hobart shifted the momentum of the game when Afghanistan international Qais Ahmed struck twice in quick succession to get rid of Peter Handscomb and Nic Maddinson. Seb Gotch (33 not out from 22) and Glenn Maxwell (43 not out from 33) were able to steer their side to victory with seven balls to spare. Meanwhile, Australia are 4/1 to win the 2019 Cricket World Cup.